When travelling in Cuba, besides staying at a traditional hotel, Casa Particulares are a very nice way to enjoy local hospitality. A Casa Particular is a privately rented room in a local Cuban home, often with breakfast and dinner included. With a license (which means they have paid their taxes), Cubans are legally permitted to rent out rooms and Casa Particulares have been growing in popularity in recent years. The Casa's are regulated and inspected on a regular basis and your host is required to record your passport and tourist visa numbers in their register, just the same as in a hotel. The cost however is not regulated and is individually negotiated with your Cuban hosts. Besides the length of your stay, you can often negotiate which (if any) meals are included. I often prefer to have breakfast every day at the Casa, and only some dinners when I am not sampling local restaurants. It is this flexability plus the local Cuban atmosphere that I find attractive about Casa Particulares. Pictued here is Casa Magaly where I have stayed on many occasions. Located in Altabana, a suburb of Havana, the house has two lower bedrooms available for rent (pictured is the rear bedroom) with a shared bathroom. Available on the second floor is a fully self-contained apartment with kitchen, bedroom, bathroom and a nice rooftop patio for relaxing in quiet solitude. Also pictured is the dining room and the lower backyard patio where you can relax in the shade and sip a cold cerveza. All bedrooms are individually air conditioned for sleeping comfort. Your hosts, Magaly and Lesme, have private quarters at the rear of the house. 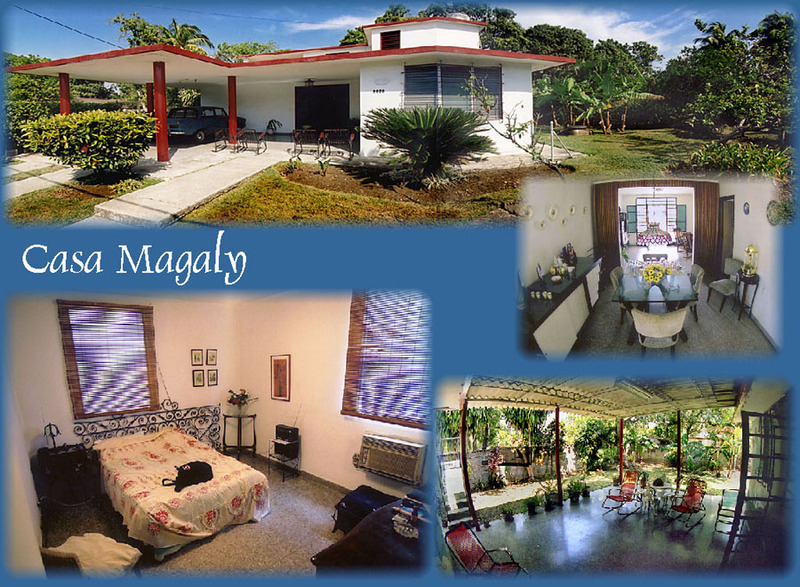 Should you have an interest in staying at Casa Magaly, just drop me an email at the Contact Steve tab and I can provide you with additional information.